As a kid the one thing about me that irritated my father was the Matriarchal free pass reserved for the first great grandchild in a family of Irish and Italian immigrants. That and a tendency to be economical with the truth when backed into a corner. Two things, then. And my smart mouth. Okay, three things. I was never nasty or vindictive, but I was mischievous and cheeky; that’s the worst you could say about me when I was a child. Although it was not apparent at the time that was the reason why my father was so strict with me. Faced with a phalanx of women who doted on me he clearly felt it was incumbent on him to redress the balance of the gaping chasm in my discipline, to keep me on a “tight leash”, so to speak — if your idea of a “tight leash” is a choke-chain that Heracles might have used to subdue Cerberus at the gates of Hades. At Christmas, however, he loosened the noose from a strangulation to a mild throttle — thanks mainly to his love of film musicals. It is impossible to convey to successive generations just how big a deal the screening of films on television was in seventies’ Britain. With only three channels, and several years before the invention of video recorders, cable or satellite, tv films were a see-it-or-miss-it event. Over the festive period the BBC would fill their schedules with classic musicals featuring Garland, Crosby, Sinatra, Astaire and Rogers, and, of course, Gene Kelly. 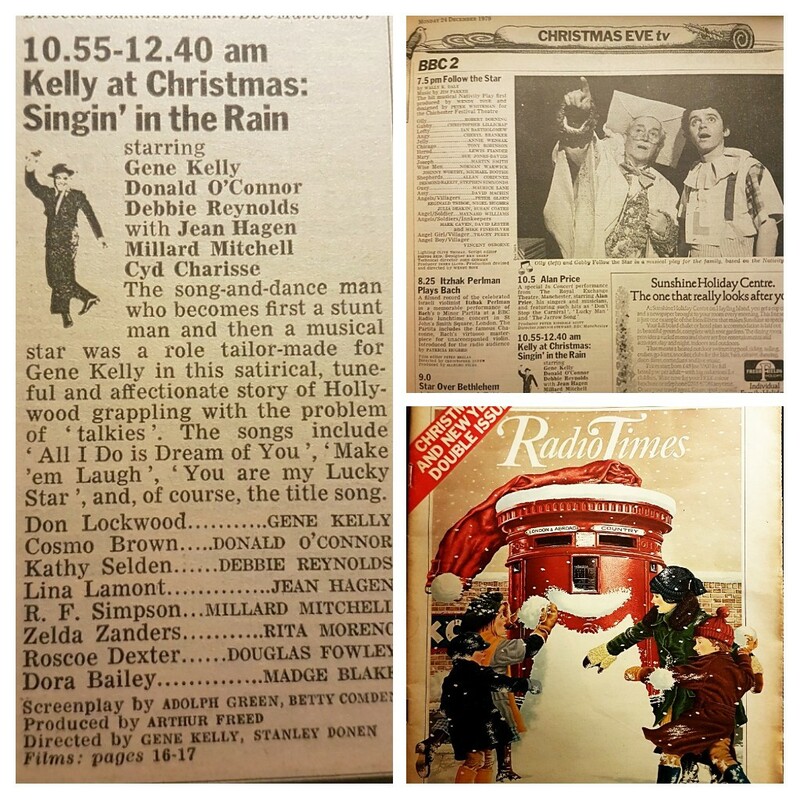 In 1979 the Beeb ran a late-night short season of Gene’s films in Christmas week called, ‘Kelly at Christmas’: Anchors Aweigh on 22nd, On the Town on 23rd, and Singin’ in the Rain on Christmas Eve. At ten years old I was already a Gene Kelly fanatic. He had been an absolute constant in my young life; like God, the Pope, and Paul McCartney. My memories of watching Kelly movies prior to that point are vague, but I will remember every detail about that Christmas — how I felt watching Gene dance… and the bombshell the old man dropped on Christmas Eve. Singin’ in the Rain didn’t start until 11pm, which meant its running time would take it over into Christmas morning. And although I had been allowed to stay up for Anchors Aweigh and On the Town it was forbidden for any child to be awake for the transition from Christmas Eve to Christmas Day in our house. This rule was originally implemented for the accommodation of a benign supernatural gift-bearing figure (whom I discovered did not exist the previous year when I accidentally found the Grease soundtrack album in our kitchen cupboard two days before the 25th). I had seen brief clips of Gene’s Singin’ in the Rain number. I had books with stills of the number that I pored over for hours. I had the soundtrack record that I played until it was literally unplayable. Being told that I wasn’t allowed to stay up to see that number was, to me, tantamount to a kid ten years earlier being sent to bed before Neil Armstrong walked on the moon. It really had that sense of import and historical significance to me. I needed to find a way to get into that living room. I did. Those without sin may throw the first snowball. Every neighbourhood has, at least, one house whose inhabitant has been identified as the enemy of all children. They’ll glower at you if they pass you in the street. They’ll complain to your parents about the most innocuous slight. They’ll stand at the window and stare if you stray within 25 yards of their property. So maybe you chap their door at night, then run away. Maybe you rip the occasional flower out of their garden. Or maybe you even all chip in to buy a set of toy binoculars, then send it to them in the mail with a little note that reads, ‘This is so you can see us better.’ In our neighbourhood it was Mr Lamington, a retired English lecturer with a shock of frizzy grey hair that matched his frazzled personality. There had been a heavy snowfall on the evening of the great Christmas Eve Gene Kelly deprivation of 1979. Snowfalls from previous years had revealed Lamington’s pathological hatred for snowballs of any description, particularly the ones we lobbed at his window with the ferocity of a medieval siege, and he would chase us down every time. I had become wonderfully adept at sneaking downstairs and creeping out the back door over the years; a master. The first snowball missed the window by a great distance, but in my defence it was the first Lamington-ball of the season. The second and third disintegrated against the wall with a pathetic little “putt”. I gathered a significant amount of snow in my hands and began moulding it into shape. I don’t know what children call them now, but we called them ‘grenades’; gently patted-down and unfeasibly large snowballs that detonated loudly on window-impact. Everything in the next few moments happened so quickly. My grenade hit Lamington’s window with a dull thud. An upstairs window opened moments later with a screeched, “I see you! I see you!” I darted back in the house, raced upstairs and fell back in bed. My heart beating like a Geiger counter. Mission accomplished. Time for Phase Three. Gently rubbing the sleep out of my eyes I descended the stairs with all the understated pity and subtle melancholy of Freddie Bartholomew in David Copperfield. I quickly scanned the doorway. Disappointment from my mother. Exasperation from my father. Incredulity from Lamington. My father invited Lamington into the house and as he ushered his delinquent son toward the living room his hands moved around my back and midriff like an airport frisk — he was checking to see how cold I was. Gene Kelly, Donald O’Connor and Debbie Reynolds were laughing as we entered the room. Before any kind of batting order could be established Lamington stepped up and started swinging. “Um… Huh?” I retorted. Brilliantly. “Answer the man.” Snapped my father. “Where I’m standing the sun is shining all over the place.” Gushed Gene. Oh. My. God. It’s happening. It is happening. “I didn’t mean to, I mean… it wasn’t me.” This was desperately inadequate material. “I SAW you. There are footprints in the snow!” Caught between the tractor beam of the old man’s seething gaze and something miraculous in the corner of the room I braced myself. “What do you know about these footprints?” Asked my father. The lamppost. He’s hanging from the lamppost. “Maybe… Maybe they’re Santa’s?” I offered, excitedly. Lamington was becoming increasingly agitated, throwing his hands in the air and turning to my father. Oh, Lord… he’s dancing. He. Is. Dancing. “Son, I’m going to ask you one last time in front of Mr. Lamington. Did you throw the snow?” Did you throw the snow? How much less innocent and childlike the act becomes when you remove the word ‘ball’ from the equation. That is not accidental. That is classic old man. “No.” I squealed, at an octave that must have registered with all the dogs in the west of Scotland. My father drew his eyes off me with the disgust that only a father can muster when his firstborn has brought shame on the family name. Lamington shook his head and saw himself out. My father followed him to the door. Alone with my mother I blurted out the reason why I did what I did. When she told me that they had both intended to wake me for that number I was overwhelmed with sadness and guilt. My mother gently raised my head. Mr Lamington never forgot what happened that night. When he tutored me for my first English Literature lesson several years later he had a plate of snowballs (Scottish coconut-flavoured baked delicacy) on the table. When he showed me the first draft of his reference for my university application, he had scored out my name and written ‘Snowy’. Out of the protagonists that evening only my mother remains. We still watch Kelly at Christmas; those three films in that order on those days every year, and have done so in the four decades since. On Christmas Eve right about the time Don Lockwood kisses Kathy Selden goodnight my mother will lean across and whisper, “Did you throw the snow?” And we’ll laugh, and maybe cry a little. Then I’ll raise a glass to departed friends and Gene fans all over the world whose childhood memories are interwoven with the immortal renderings of a song and dance man with joy in his heart and magic in his heels.